I wrote yesterday about how the Dept for Work & Pensions’ response to my FOI request demonstrated that the government has spent nothing on any analysis of the likely impacts of the switch in 2013 from ‘Disability Living Allowance’ (DLA) to ‘Personal Independence Payment’ (PIP) on the lives and wellbeing of the disabled people the change will affect. If you’re unfamiliar with DLA and PIP, some more information on them can be found in yesterday’s article, or by visiting the DWP’s website. It turns out that an extremely cursory impact assessment was done – you can see it here. If you bother to read it, you’ll see that whatever else it analyses, the impact of the loss of benefit on the 500,000 disabled people who will be excluded from PIP is not included! So, I’ve been doing a bit of investigation and a few basic calculations myself. Even using the most cautious, ‘best-case figures, I’ve already seen that the government’s plans are likely to push at least 160,000 people into poverty and will definitely do so to around half that figure. The graph below, which appears in the DWP’s document but without analysis of its significance, shows the distribution of disabled people at various income levels. For the non-disabled population also shown on the graph, ‘deciles’ are shown – dividing the population up into strata that represent 10ths of the total population, but for disabled people, you’ll see that the spread is rather different. The income calculations include any DLA payments. UK governments define poverty as having an income less than 60% of the nation’s median income. The third column of figures shows the level of weekly income for a selection of types of individual and family that represents the poverty threshold – in other words, falling below that level means you’re in poverty. The subsequent columns show bands of income – this time represented in quintiles, or 20% of the total, which doesn’t mesh perfectly with the other graph but we can work around it. The bottom quintile represents the bottom 10% of earners on the earlier graph plus the next-lowest 10%. The webpage containing the table advises that 10% of the population has total earnings below the 60% poverty threshold. Working from the data in the table, this means that the next-lowest decile earns less than £20 above the poverty line for people with no children, less than £25 above for a single person with 2 children, and less than £31 above the line for a couple with 2 children. Working from the 2nd-quintile figures, we can see that the 3rd-lowest band of earners start at just above these levels. Let’s be cautious and assume for this discussion that everyone in the lowest two earnings bands are on the minimum DLA level. As the first graph showed, 7% of disabled people are already in the lowest earnings band and therefore already below the poverty line. The loss of DLA to these people will be a hammer blow that drives them even deeper into poverty. 10% of disabled people are in the next-lowest income band, just above the poverty threshold. Even if they’re only receiving one DLA component, the loss will be enough to tip over almost all of them below the poverty line. 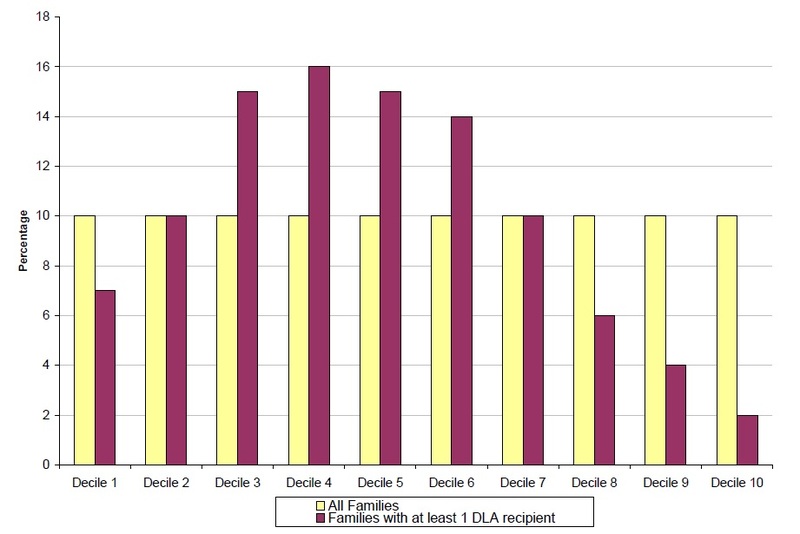 All of those receiving 2 components would be pushed by the loss of them below the line – even if they’re only receiving the minimum DLA levels in both. And for those currently receiving – and then losing in 2013 – higher DLA levels, the loss will be enough to push even those in the 3rd-lowest band below the poverty line. But for now let’s be cautious and just look at the two bottom bands. A total of 17% of disabled people are in these bands. The DWP says that 500,000 people currently receiving DLA will not receive PIP. 17% of 500,000 equals 85,000 people losing the benefit. This means that in the most ‘optimistic’ case – where all those affected are single, have no children and are currently only receiving the lowest levels of DLA payment – 85,000 will either be pushed deeper into poverty or pushed from merely being low-paid into poverty. Once you factor in those who have children, and those who are in the 3rd- and 4th-lowest bands at the moment but are only there because they’re receiving the standard or upper levels of DLA, that number will easily double or worse. Perhaps much worse. The DWP claims that the switch to PIP is meant to be ‘enabling’ – helping disabled people have more active, fulfilling and productive lives. But even a basic look at the effects of its policy – not even considering the fact that those caring for DLA-recipients will lose their carer’s allowance as well, or any of the many other factors that will come into play – shows that the effect of the policy will be to push hundreds of thousands of people into poverty and despair. The DWP’s ministers are despicable, but they’re not brainless. They must know what their policy will do to such a vast number of people – but a proper impact-assessment would put the facts into the official, public record. No wonder they didn’t want to do one. If you want to know more about the likely impacts of this insane and callous policy, which is fully in keeping with the ethos and ideology of the most right-wing and destructive government the UK has suffered in generations, the campaign group Disability Rights UK carried out its own assessment of the impact of the PIP plans both on disabled people and the wider UK situation. You can find it here. ← DWP spent NOTHING on assessing impact of DLA/PIP change? Excellent analysis – in reality, having studied the proposals for PIP, we will, as disabled indivuals, be punished for ‘coping’ with our disability. I am both disabled and a carer – I have never felt so powerless or afraid. Thanks for the comment – the government’s shameful treatment of disabled people and of the NHS will be remembered to its shame for generations. Indeed it will – but the damage will have been done and, sadly, I don’t see Labour changing it. I want to believe that they will but…. Anyway – I intend to go down fighting.Of course that will be used against me LOL.